Colours are marched in by 539 High Prairie Cadets. Left-right, are AC Jade Tancowny, Cpl. Keith Cramer and Cpl. Coleby Zelman. Legion president Don Ebbett stands and salutes at the podium. Thanks and tributes were expressed for those who fought for the freedoms of Canadians during a Remembrance Day service in High Prairie Legion hall on Nov. 11. “It’s very important to remember them,” says local Royal Canadian Legion president Don Ebbett, who led the service that drew a crowd of about 350 people. He read the names of many people from the High Prairie area who sacrificed their lives in wars. “What a waste,” Ebbett says. Special mention was given to the centennial of the Battle of Passchendaele in Belgium where 55,000 Commonwealth soldiers died. “All of those guys died for nothing,” Ebbett says. Representatives from federal, provincial and local government shared words of thanks and honour to those who served. A message from Peace River – Westlock MP Arnold Viersen was read by High Prairie RCMP Sgt. George Cameron. Words from Lesser Slave Lake MLA Danielle Larivee were read by Ebbett. Local municipal leaders also shared, led by Town of High Prairie Mayor Brian Panasiuk. “Today is a day for the people of our great community to join with all Canadians to remember the men and women who have served and sacrificed so much for our country and to salute those who continue to serve Canada today,” Panasiuk says. 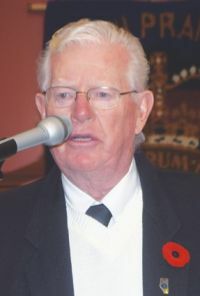 He noted the Wall of Fame in the Legion hall that honours those who died in service. “Reading the stories, it is a reminder of the sacrifices the people and families of this community have made,” Panasiuk says. Big Lakes County Reeve Ken Matthews added to that message to honour those who served. “They paid the price so you could have freedom,” Matthews says. “We have to remember why we’re here with the freedoms we have. 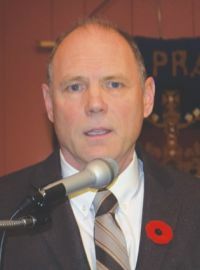 A biblical message “To Serve is to Love” was shared by Chaplain Pat Duffin, pastor of the High Prairie Christian Centre. “I want to commend, to serve is to love, to give is to love,” Duffin says. He was encouraged by those who served and those who respect. “Canada has never failed to keep that somber anniversary of the cessation of hostilities and the remembrance of our fallen heroes and the horrible cost of war and the precious price of freedom,” Duffin says. “I am so proud of these special people who cared so much about making a difference and who sacrificed their lives on behalf of others. Several other church ministers participated in the service. One pastor encouraged people to be an example to following generations to be grateful for those who serve and protect the country. “We need to teach our children and grandchildren to thank our servants for giving us freedom,” says Rev. Brian Gilroy, pastor of the Nazarene Church of High Prairie. Two teens shared special readings during the service. In Flanders Fields was read by Sgt. Jared Gomes of 539 High Prairie Cadets. 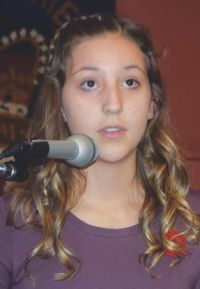 St. Andrew’s School student Kaylee Ferguson read a poem she wrote and received honourable mention at the Legion District Level in the annual Remembrance Day contest. 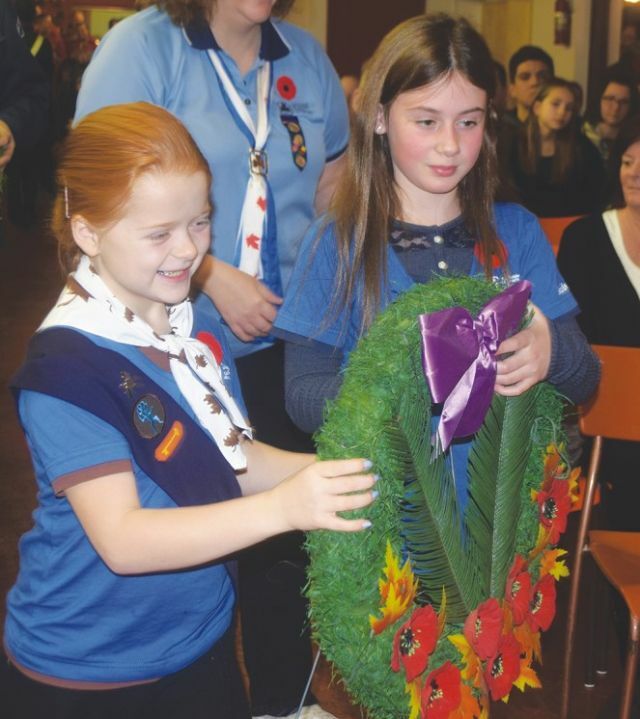 High Prairie Girl Guides Alex Zelman, left, and Morgan Jones, lay a wreath. 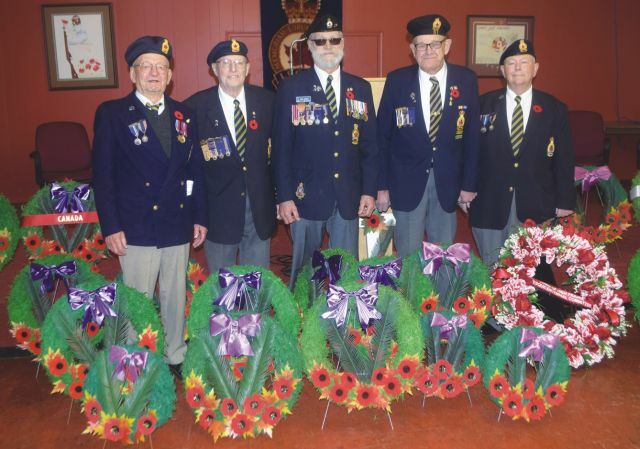 Some members of the High Prairie Legion stand among the wreaths laid at the Remembrance Day service. Left-right, are treasurer George Bennett, member Murray Couch, president Don Ebbett, member Tony Belli and Chaplain Pat Duffin. Kaylee Ferguson reads the award-winning poem she wrote for Nov. 11. Big Lakes County Reeve Ken Matthews speaks to the audience. Sgt. 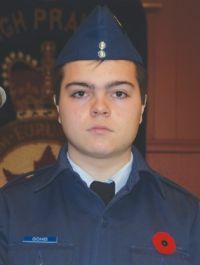 Jared Gomes of the 539 High Prairie Air Cadets reads In Flanders Fields. Town of High Prairie Mayor Brian Panasiuk shares words on behalf of town citizens.